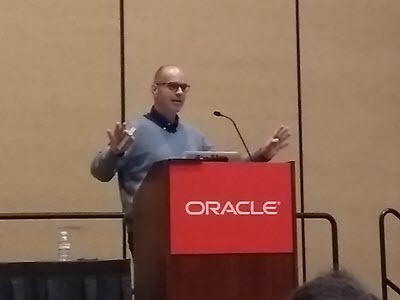 First up for me was Joel Kallman speaking about “Oracle Application Express 18 New Features”. As followers of the blog know, I’m the worst Application Express (APEX) developer that has ever existed, even though I’ve been using it since before it got named APEX. APEX is becoming a bigger thing for us at work, in no small part because I keep pushing out small applications using it. I wrote down a list of things I need to take a look at, so fingers crossed I will get a chance to do that soon. 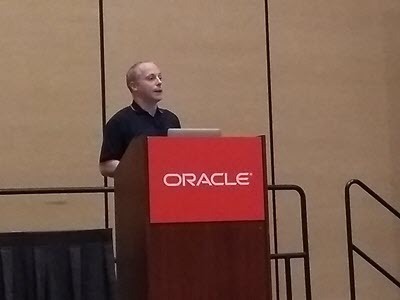 Next up was Colm Divilly with “Kicking mod_plsql to the Curb for a Modern REST-Driven Application”. We use Oracle REST Data Services (ORDS) at work, but we also have a bunch of things lingering on mod_plsql, partly due to time/testing constraints and partly due to the use of the mod_plsql document upload/download functionality. Yes, we could have rewritten that, but… Well ORDS 18.3 has us covered, due to the inclusion of the “owa.docTable” parameter. I’m hoping I can try this out when I get back, and maybe rid myself of the mod_plsql dependencies once and for all. He talked about a bunch of other stuff, including database authentication, but the upload/download stuff will have the biggest impact on me personally. Next up it was me with “DBA Does Docker“. Overall the talk went OK, but I got my timing kind-of wrong and spent too long on the demos, so I ran out of time at the end. Another 5-10 minutes would have been nice, but them’s the breaks. 🙂 I got a lot of questions at the end, so I took them outside so as not to annoy the following speaker too much. By the time I finished answering questions I had missed all but the last 10 minutes of the final session, so I hung around until that finished and met up with Connor and Roel to walk back to the hotel and then grab some food. Tomorrow (Friday) I start the journey back to the UK, finally getting home on Saturday evening UK time. I’ll write a wrap-up post when I get back with my impressions on the conference as a whole.